Sometimes it's not easy being an author. Starting out, as with everything else, is the hardest part for many. Knock backs are to be expected, but unless you can roll with the punches you'll never make it to the second round let alone the second chapter of your story. One such author that experienced his fair share of hurdles in Simon Okill. But through hard work, true grit and determination, he has come out swinging and is now the proud author of the adult humour/paranormal romance novel 'Nobody Loves a Bigfoot Like a Bigfoot Babe'. I live with my wife, Shirlee Anne and our cat, in a pretty coastal town in South Wales, UK. We both love Stephen King and had read many of his books and enjoyed their transition to the screen. Due to our love of books, my wife and I dabbled in writing for some years as a hobby. We were approached by a film company to write a paranormal TV series. We struggled most nights and all through weekends to come up with 22 episodes only for the company to go bust. Then after a serious accident at work, I was forced into early retirement due to disability. I used my newfound skills as a writer to help with my depression. We decided to use our TV series episodes as templates for film scripts and novels. My writing became more serious as certain A-list actors expressed interest in my scripts and my debut novel Nobody Loves a Bigfoot Like a Bigfoot Babe was accepted by Christopher Matthews Publishing after so many British publishers turned it down. More Bigfoot to come. Nobody Loves a Bigfoot Like a Bigfoot Babe by Simon Okill is a part comedy, part mystery, part who done it novel, that despite laughing at the title, I really enjoyed. I found that once I got into the book I could not put it down. The author did a great job in developing a story that at times seemed a little bizarre, yet at those time I would literally breakout laughing. The storyline was well developed and easy to follow. There were plenty of twist and unexpected turns which kept you glued to the story. I like each of the characters in the story. Simon Okill did a great job in building each character and making them easy to identify with. The characters were down to earth and believable. 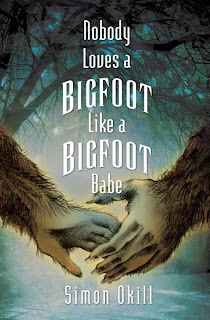 I enjoyed Nobody Loves a Bigfoot Like a Bigfoot Babe by Simon Okill and recommend it to adult readers (due to mild sexual content). Read it and have a good laugh. 'Nobody Loves a Bigfoot Like a Bigfoot Babe' is available from Amazon US & UK in both electronic and printed formats. Guest Post: Fantasy Author, John Gwynne. Guest Post: Fantasy Author, Brian Staveley.